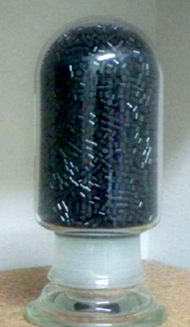 R3-11G, "BASF R3-11G", "O2 Removal", Oxygen Removal", Deoxo, "BASF Catalysts", Hydrodesulfurization, HDS, R3-11, "BASF R3-11", R3-12, "BASF R3-12", R3-15, BASF R3-15", R0-20, R0-20/47, "BASF R0-20", BASF R0-20/47", Engelhard, Q-5, "Engelhard Q-5", Cu-0226, VOC, "Catalytic Oxidation", "Catalytic Incineration", "CO2 Purification", "Deoxo Catalyst", "CATOX Catalyst", CATOX, "CATOX Reactor", VOC, "VOC Catalyst", "VOC Reactor", "VOC Abatement"
Our OxiGone product line comprises a range of supported precious metal catalysts: platinum and/or palladium, highly dispersed on high surface area carriers. These types of catalysts can be applied in a diversity of ways. Primarily designed for Deoxo and CATOX reactions, their applications include O2 removal by reaction with H2 or hydrocarbons, H2 removal by reaction with O2, oxidation of hydrocarbons for purification of CO2, and destruction of CO and VOC's for environmental protection. Additionally, these catalysts are also applicable as hydrogenation catalysts, effective in converting acetylenes to olefins and/or olefins to the corresponding alkanes (e.g. propylene to propane). We carry a wide variety of Copper Catalysts for use in scrubbing oxygen from gases and liquids. The reaction is between O2 and active copper sites on the catalyst which remove the O2 by chemisorption. The catalyst must be activated by reduction (e.g. with 1-2% H2, balance N2) at around 200 degC, and may be regenerated in similar fashion. These catalysts cover a range of shapes, sizes and compositions. Product data sheets, safety data sheets, and quotes are available upon request.